Two leading Mission District muralists from different generations talked Wednesday morning and quickly turned a mural conflict into a new mural project. The conflict arose earlier this week when interns for Norris painted over a mural on the Revolution Café’s east facade on Bartlett Street. 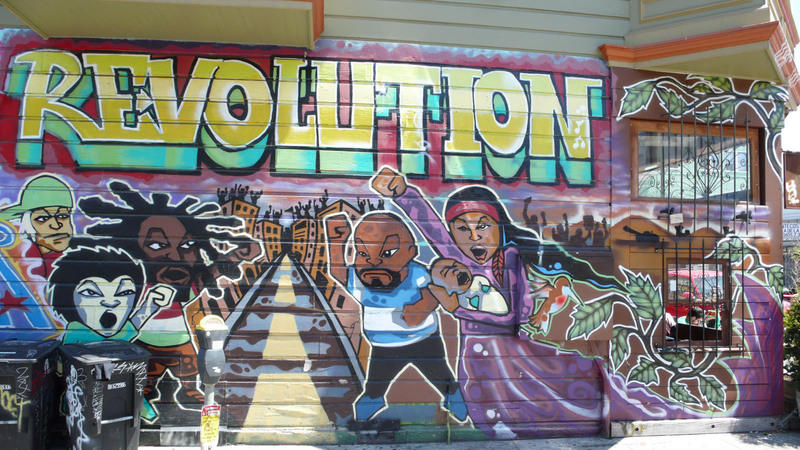 That mural had been created by Cuba, a 46-year-old muralist who has been working in the Mission since the early 1980s. Norris, whose work resides in places like Clarion Alley and businesses like Jay’s Cheesesteaks, had been asked to redo the wall for a fundraiser on June 19th for a new Mission Community Market. He planned to involve youth from the Mission and assumed the owner had informed Cuba that his mural would be painted over. It quickly became clear that no notice had been given. Norris tried to get the artists’ phone numbers and when he did this morning, quickly called Cuba. “Sirron is getting more then he asked for (in terms of attacks) when in fact he was invited to paint a mural and what’s he to do if someone offers him a job,” said Cuba who pointed out that getting a wall to work on is not easy. He said that after years of trying he had only recently gotten the wall of the Mission National Bank. Earlier Norberg, who painted some peripheral parts of the older mural, said the owner of the Revolution Café had failed to follow a simple courtesy of informing Cuba. Susan Kelk Cervantes, who founded Precita Eyes Mural Arts Center in 1977 and has worked as a muralist for nearly 40 years, agreed. “If they know who the artist is it’s a courtesy to give a 30-day notice that they intend to paint it out,” she said and added that this is not legally binding, just good mural manners. Andre Larzul, the owner of Revolution Café, did not respond to e-mails and was not at the café. In cases where city funds are used, she said, there is often a contract signed between the owner and the artist that includes an alteration and destruction clause. It calls for a 90-day notice. Two years ago, however, a fire charred the wall and Cuba and another muralist, Dino, used their own funds to repair it and painted a Native American chief over the original scene. It was Cuba’s first project after being bed ridden with a broken hip. “To get up and paint that Revolution meant something,” he said adding that at the time he was walking with a cane, but going up and down the ladder strengthened his leg. There was no way that Norris could have known that history, he said. Indeed, when Norris heard about Cuba’s connection with the wall, he sounded dismayed. Both muralists, however, were ready to move on to create something new – and sounded pleased to be doing so together. It seems this article clears up the previous one where everyone was attacking the artist. It seems the community should re-direct their sentiments towards the building owner for the insensitive move. Glad to see both artists coming together to resolve the issue. This story is tired. Let it go.